Editor’s Morning Note: Let’s end the week with a chart that points down. Bitcoin Mining In Action. Via NSA Archives. Happy Friday, friends, and welcome to our final entry together for the week. May the day go well, and when you reach that moment when you are finally closing more tabs than you open, enjoy it. The line shows the rise and fall in the dollar revenue value that bitcoin miners currently earn from their operations. 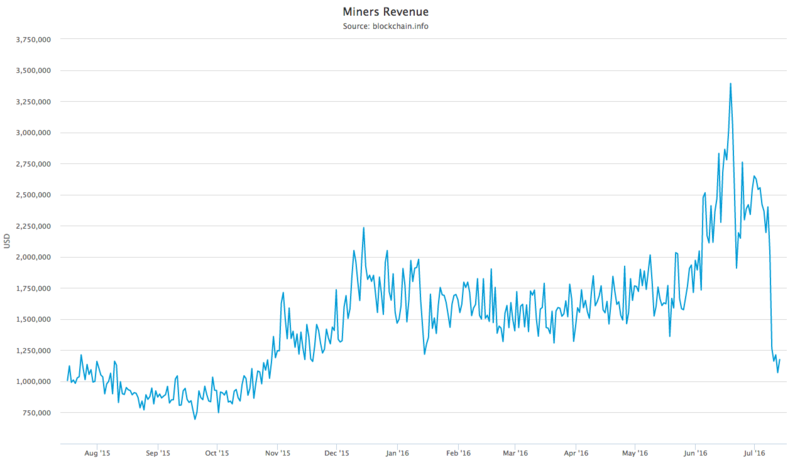 Mining hit 52 week revenue lows in early Autumn 2015, before spiking in Summer 2016 following a dramatic rise in the price of bitcoin. What drove the price of bitcoin up, and eventually dragged down the aggregate income of the cyptocurrency’s mining community? Perhaps the same thing! Say hello to The Halvening. Half The Coins, Double The Fun? Bitcoin miners provide computing power to the bitcoin blockchain, activity that is rewarded by the regular disbursement of newly created bitcoin. Those coins have exchange value. So, bitcoin miner revenue is largely the product of the number of new bitcoin released on a regular basis, and their at-time exchange value, usually measured in dollars. Built into bitcoin’s code are several supply controls. Two are most important for us today: The hard bitcoin cap, and the rate of inflation. There is a 21 million unit hard cap of the number of bitcoins that will be created. To slow the race of bitcoin inflation on its way to 21 million, there are periodic halvings of the number of bitcoin generated by mining. One of those halvenings just happened. The price of bitcoin rose in advance, something that was heartening as it wasn’t clear if the current bitcoin mining community could survive at current input level requirements if their income fell by half. But with a rising bitcoin price, the halvening looked less scary; hold supply flat and cut price in half and your income is cut in half; spike the price and cut your per-disbursement number and things balance out at least somewhat. So, how terrible is it that bitcoin mining just went through a halving? Well, imagine the chart above, but without the spike in aggregate revenue before supply income was reduced by half. It would look even worse1. Now the question is whether the bitcoin mining community can survive on current incomes. The answer is yes, but if the same players will keep their places is less certain. Top Gif From Reddit, Via Giphy. There is far more nuance to mining revenue than we are allowing at the current moment, but there is only so much time in a day.